https://southdenver.bintheredumpthatusa.com/dumpster-rental-aurora	Bin There Dump That South Denver	https://southdenver.bintheredumpthatusa.com/img/franchisees/1.jpg	202-10004 Dransfeldt Rd, Parker, CO	Contact us for more details. Discover how we make renting a dumpster in Aurora, CO a simple and easy process. 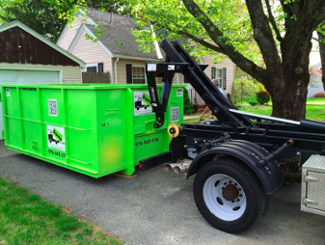 Bin There Dump That is committed to making the dumpster rental process for the customer a seamless transaction, from placing an order for the needed dumpster size to delivery of the waste container in Aurora to an immediate pick up when you no longer need the bin on your driveway. Appliances are not allowed in the dumpster, such as, refrigerators, stoves, etc. Some hazardous materials such as paint and lacquers are also not permitted. Other than those items, nearly everything can go into a dumpster. From your old nitty gritty kitchen cabinets to the shingles on your roof! At Bin There Dump That, we offer a wide variety of size dumpsters for any type of project you’re working on. From 4 yards for minor waste removal projects and such up to 20 yards for a full overhaul of your living space. Aurora has grown from a struggling frontier town into a major modern city with almost 375,000 inhabitants. It's the state of Colorado's city and it's centrally located near Denver and just a few minutes from Denver International Airport. Aurora has a great school system split between four districts and the opportunity to obtain a degree of higher learning without ever leaving the city. Business is also booming. Major industries include aerospace, healthcare and transportation. The park system in the city is well developed with more than 100 different parks set on 6000 acres of green space. There are plenty of trails for hiking, jogging and biking. There are also several award winning golf courses in town such as Aurora Hills and Saddle Rock. There are dozens of historic sites that are worth a visit in Aurora. Gully Homestead is a chance to see what life was like in the area in the 1870's and the DeLaney Round Barn, built in 1902, is a must on any tour of the city. There's a proud tradition of arts and culture in town as well. The Aurora Fox Theatre & Arts Center is a small intimate venue that seats 245 guests, or if you prefer classical music there's always the Aurora Symphony Orchestra. Downtown Aurora is a busy place packed with great stores and plenty or restaurants to choose from. The nightlife is impressive and wherever you go in Aurora you're always surrounded by majestic views of the Rocky Mountains. There aren't many cities that compare to Aurora. Your local Dumpster Rental Aurora dumpster rental operator is Bob Cotner And Joe Chupp.